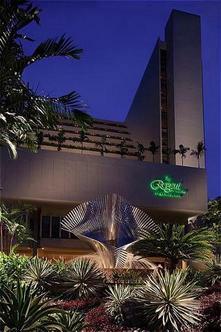 It is conveniently located in the city's most select area, central to the business district, the tranquil Botanic Gardens, and minutes away from Singapore's most exclusive shopping and entertainment hub of Orchard Road. A grand ballroom, 13 function rooms, a business centre and a well-equipped gym. Spacious guestrooms with High Speed Internet Access. All-day dining at Capers, Cantonese cuisine at Summer Palace, Afternoon Tea at Tea Lounge and drinks and live entertainment at The Bar. Voted among the worlds top hotels in Conde'Nast Travler Gold List.